"The trail is around her. I know it's near trees." This is the second installment of Steve Oedekirk's Thumbation series, after the release of the genuinely funny Thumb Wars, which of course was a wicked lampooning of the whole Star Wars mythos. 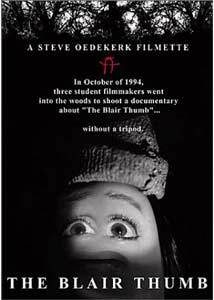 Oedekirk's technique of using thumbs as actors, with strategically placed human eyes and mouths superimposed onto fully costumed digits is both bizarre and clever, and despite the visual weirdness, this take on The Blair Witch Project is just not that funny. Searching for the mysterious Blair Thumb, three filmmakers venture into the woods near Thumbsville (formerly Die), armed with video cameras and sound equipment, but "no tripod": hence, the shaky camera. Stressy (Megan Cavanaugh), Vic (Steve Oedekirk) and Jish (Jim Jackman) re-create a lot of the familiar scenes from the original, with often lackluster results. Condensing the familiar Blair Witch story into thirty minutes isn't the problem, it's the jokes. They mostly fall flat, and there is just far too much annoying screaming that I think is supposed to be funny, but instead comes across as simply headache-inducing.Maybe it's because The Blair Witch Project has already been parodied so many times by a myriad of different filmmakers that this installment just doesn't work as well. Some of the jokes and bits are moderately funny, but those are few and far between. There isn't as much of the well-written satire that was present in Thumb Wars, and the inclusion of a "woods shark" just seems like a tired tweaking of the old SNL "Land Shark" bit. I like the whole thumb bit. It's visually engaging, and certainly surreal. But with insipid humor and moronic screaming, this short film falls apart quickly. One of the next projects from Oedekirk is a parody of Batman, entitled Bat Thumb, and if the included teaser trailer is any indication, that should be light years better than The Blair Thumb. Image Transfer Review: Image has released the second in Odekerk's thumb series in a 1.33:1 full frame format, and like its object of mockery, The Blair Thumb uses a combination of both color and black & white footage. Colors are not as rich as they were in Thumb Wars, because it seems that much of the short was shot in what is supposed to pass as darkness, and there are as many elaborate set piece sequences as there were in Thumb Wars. Black levels are fairly solid and detail is average, with the overall short trying to look too much like the original, in terms of camera shakiness, to really amount to much visually.On the plus side, the print is clean and blemish free. Audio Transfer Review: Image provides a pair of interchangeable audio tracks, in Dolby Digital 5.1 and 2.0 surround. While the 5.1 offers a little more depth to the sound field and gives the score a boost, there really is not much difference between the two. Rear channel cues are pretty much non-existent, with the bulk of the sound split across the fronts. The occasionally funny character dialogue comes across clean and is mixed well. Extras Review: For such a short feature, there is a surprising amount of extras, though not all necessarily of worthwhile quality:CommentariesThere are two full-length commentaries here, and at first that seemed a little excessive. The first track, labeled the Sane commentary, features Steve Oedekirk, Paul Marshall, Tim Rose, Dave Merrell and Todd Portugal, and is one of those self-mocking discussions that plays more like a series of inside jokes than any substantial insight into the production. Portugal provides the most insight, but he is overshadowed by some generally inane comments by the others.The second commentary is identified as the Insane track, and it is a completely unlistenable mess of babbling, unrelated comments by what sounds like a group of mentally handicapped individuals. To be honest, I don't know who the speakers are, or what the point of this track is. Unfunny and pointless.Deleted ScenesA pair of cut sequences run just over a minute in total, and are on par comedically with the rest of the film, which is to say that they are moderately humorous, and their addition or deletion would really have made no difference whatsoever. The scenes are:Woods Shark Argument (:45s)Jish Complains (:22s)Outtakes (1m:45s)This segment is a series of seven supposedly funny "outtakes", and they are mildly amusing. Like most of the extras, it is mercifully brief.StoryboardsI'm not sure why this set of storyboards was included, as the film itself is fairly simple on its own.Behind-the-Scenes Featurette (4m:08s)Broken into four segments, this featurette is a collection of generally unfunny interviews with the thumbs, who discuss their motivations, etc. I did laugh when one of the thumbs stated he was a method actor, and simply "pretended the director was a stump. "The best part of the extras is the inclusion of teasers for the next two Oedekirk thumb productions of Bat Thumb and Thumbtanic. These look terrific, especially when compared to the lukewarm The Blair Thumb. This new parody is a weak follow-up from Steve Oedekirk's Thumbation studios. A few good jokes are buried beneath far too many bad ones.I'll just have to wait for Bat Thumb.